United Kingdom consists of two main islands: Britain and the northeast of Ireland. A union of four countries: England 103,400 sq km, Scotland 78,800 sq km, Wales 20,800 sq km, Northern Ireland 14,100 sq km. Also three small autonomous states that are dependencies of the British Crown: Isle of Man 588 sq km (in the Irish Sea); Channel Islands 194 sq km (Guernsey, Jersey). When I started reading about the United Kingdom, I was really shocked at the numbers. Only 60% are Christians and of those 8.8% of Evangelicals. Since the United Kingdom is made of four countries, I thought I would put all four Prayercast videos on my blog today and let them speak for themselves. The videos will give you some ideas of what you can be praying for, but revival is definitely one of them. 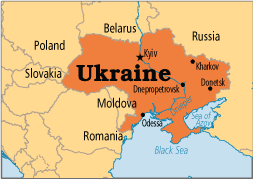 Ukraine, a former member of the communist USSR, achieved it’s independence in 1991. It is a country of just under 48.5 million people. Of those 48.5 million people around 79% claim to be followers of Christ while just under 4% claim to be evangelicals. Since 1991 it has been a struggle to take advantage of it’s economic resources. There has been a rapid increase in alcoholism and the number infected with the AIDS virus. While Chernobyl seems like a distant memory to most people in the past, it still very much is influencing the lives of those in Ukraine. Even though it occurred in 1986 it is still impacting the environment and causing disease and death. The continued missions work, both in and outside of their country. The different churches to come together and work towards a common goal of seeing others come to Christ. 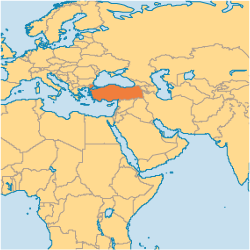 Turkey straddles two continents, but by far the majority (97%) of it lies in Asia. 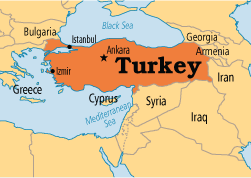 Turkey is a predominantly Muslim country with 96% belonging to that religion and less than 1/4 of 1 percent being Christian. That is around 163,000 out of the almost 76 million people. That number is in decline too. The Evangelical population only claims just over 7,000 people, but there is a small growth happening there. The most difficult thing for Christians in Turkey is fear of persecution and so discrete ways of distributing Christian information is vital. Bible correspondence course, online courses, websites and relationship witnessing are some of the most successful practices. The presence of Turkish immigrants in other countries (especially Germany and Austria) lead to a unique situation as well where Turks move to a new country, become Christians and then go back to their homeland and lead their friends and family to Christ. Cultural barriers to be broken. Christians to have freedom to share their beliefs. The Turkish immigrants in other countries to hear, see and believe the truth about Christ and for them to have a desire to return home and share what they have learned. For creative outreach to be used and be successful. 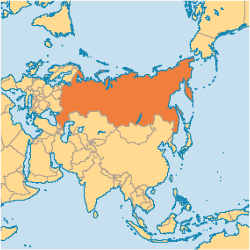 Russia is the world’s largest country, extending across 9 time zones between the Baltic and the Pacific and lying in two different continents. With a population of over 140 million just under 94 million (67%) claim to be Christian while only just over 1.6 million are evangelical. After the fall of communism there was an influx of Christianity but within recent years it is becoming more difficult for missionaries to get into Russia, let alone stay for longer periods. 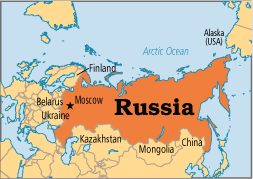 The Russian Christians to unite and reach their fellow Russians for Christ. Pray for sustainable, balanced growth that matches quality with quantity. Religious freedom to stay a reality. Each Monday for the next year I will be sharing some data with you all about one country that Greater Europe Mission ministers to in Europe, Asia or Africa. The data I will be getting will be from Operation World. Operation World is an evangelical Christian organization that is concerned about fulfilling the Great Commission. They have compiled information on every country in the world and I want to share it with you so you can be praying for Europe specifically. I will also be using a book put out by Greater Europe Mission called “Prayer for the Nations.” Inside the book it has a guide for each country that makes up Greater Europe. There is much more detail then I will share, but if you want a copy of the book for your own prayers please let me know and I will get you one. 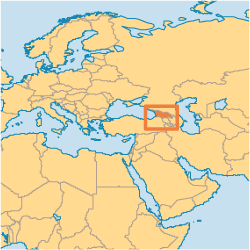 This Asian country is tucked in on the East coast of the Black Sea between Russia, Azerbaijan, Armenia and Turkey. It has a population just over 4.35 million. 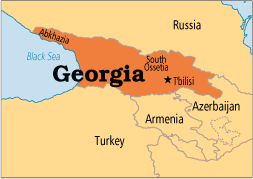 Things are looking up for this small country in the decades since Georgia declared it’s independence from the Soviet Union. The former Department of Atheism at the national university is now a theological faculty and legal changes have made it easier for non-orthodox faiths to operate. Pray for a church-planting movement to start with the existing local churches. Pray for more workers foreign and domestic to share their faith with this area that is so open to the Gospel. Pray for the new movements among the youth to flourish. I have talked several times about why Europe is in need of missionaries and why I am going over there to do my part, but I thought it might help if I highlighted more specifically what is going on in each of the countries in Europe. So, my plan for the next year is to share some data with you all about one country in Europe every Monday. The data I will be getting will partially be from Operation World. Operation World is an evangelical Christian organization that is concerned about fulfilling the Great Commission. They have compiled information on every country in the world and I want to share it with you so you can be praying for Europe specifically. I will also be using a book put out by Greater Europe Mission called “Prayer for the Nations.” Inside the book it has a guide for each country that makes up Greater Europe. There is much more detail then I will share, but if you want a copy of the book for your own prayers please let me know and I will get you one. 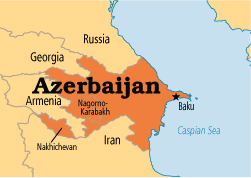 Azerbaijan is another one of those Asian countries that puts the “er” in Greater Europe Mission. Azerbaijan is a relatively small country straddling the border of Europe and Asia with a total population of just under 9 million. Of those very few are Christians, some estimates are as low as 3,000, others only as high as 10,000. The biggest prayer need for this country is for the large population percentage that have never heard the Gospel (as high as 63% of the total population). In addition to that the word Christian is often associated with the Russians and Armenians who have been warring with them for their land for quite some time. This negative stereotype of Christianity is a major stumbling block for any Azeri who might be considering professing faith in Christ. I have talked several times about why Europe is in need of missionaries and why I am going over there to do my part, but I thought it might help if I highlighted more specifically what is going on in each of the countries in Europe. So, my plan for the next year is to share some data with you all about one country in Europe every Monday. The data I will be getting will be from Operation World. Operation World is an evangelical Christian organization that is concerned about fulfilling the Great Commission. They have compiled information on every country in the world and I want to share it with you so you can be praying for Europe specifically. There are two new things this week. The first you may have already noticed. 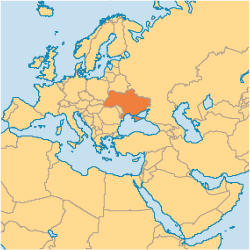 The highlighted country for today, Armenia, is not a European country. It’s in Asia. Greater Europe Mission works in some Asian and African countries (they put the “er” in Greater). The second change you might not notice too much. Greater Europe Mission has put out their own book called “Prayer for the Nations.” Inside the book it has a guide for each country that makes up Greater Europe. There is much more detail then I will share, but if you want a copy of the book for your own prayers please let me know and I will get you one. For a country i know very little about, it is a pretty populous country. 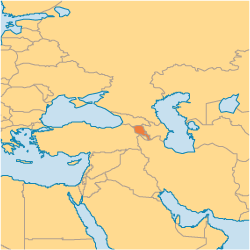 There are 3,090,379 people in Armenia, 94% (2,918,245) of which are Christian. 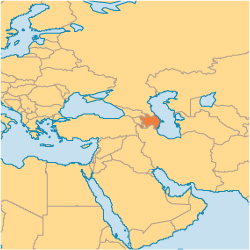 Armenia was the first nation to adopt Christianity as the official religion in 301 AD. It is not a whole lot different than the other countries I have touched on so far though in that a small minority (268,186 or 8.7%) are evangelical. I don’t mean to be stressing so much about that, but honestly with Operation World’s definition of evangelical, they are the one’s trying to reach other’s for Christ. The Great Commission says that is what we need to be doing, so that is the number that I hope to see increased. Pray that God will give Armenian believers wisdom, courage, and creativity to reach out to their people. 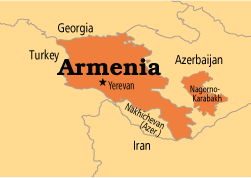 Pray for unity among the churches in Armenia. Pray that young adults will become catalysts for renewal and spiritual awakening in the Armenian Apostolic Church.